See that funky lookin' fella up there? Ya do? Well guess who that is. That is right, it is me! How did you know? Since I do not own a digital camera or scanner I have never posted a picture of myself on my site, until now of course. I was in Animation class and my teacher let me use her digital camera to take pictures of the Administration of our school. I went around with my friend Anna (you can check her site out in the Links section) and she decided to sneak a shot of me. It's a real bad shot, but its the only picture I got, so I figured I would upload it. Don't ask why, 'cause I don't know. 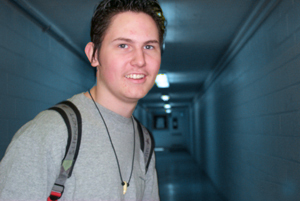 This picture was taken in the hallway by the gyms in my high school (as if the school bag didn't give it away or anything). I know I look preppy in this picture, but I am really not. If you look close enough you will see that my strap says Slipknot. Although not a metal head, my music interest ranges from Emo and Punk, to Heavy Metal, to Techno. Im strange like that. Well now that you have seen me, you may point and laugh at my hideous face (haha).